Born: 9 February 1881, Durban, South Africa. Died: 1918, Place not known. 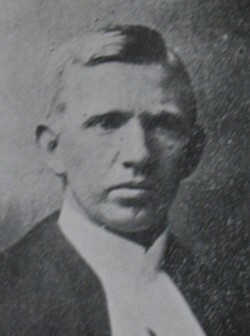 James A.H. Armstrong, son of James Armstrong and his wife Isabella, matriculated in 1900 and passed the intermediate examination (first year) of the BA degree of the University of the Cape of Good Hope in 1901. He did not complete the degree, or any other qualification at the university, but by 1906 practiced as a solicitor and conveyancer in Durban. As early as 1895 he became a member of the Durban Chess Club and competed several times in intertown matchess between Durban and Pietermaritzburg. Another of his interests was geology, including mineralogy. In 1907, when the annual congress of the South African Association for the Advancement of Science was held in Natal, he contributed a paper on "Sedimentary deposits in Natal" (Report, 1907, pp. 71-76), though he was not a member of the society. During the next few years he contributed two further papers to the society's annual congresses, "Geology and mineralogy of Natal" (Report, 1909, pp. 123-128) and "Notes on the constitution of certain rocks of the archaean age in the province of Natal" (Report, 1910, pp. 254-262). By this time he had been elected a Fellow of both the (British) Chemical Society and the Geological Society of London. In September 1910 Armstrong was elected a member of the first council of the Natal Scientific Society in Durban. He contributed several papers to the society's proceedings, including "Ancient stone implements" (from the coastal belt of southern Natal) and "The Ice Age in Natal", both published in The Naturalist (1911, Vol. 1), and, with G.N. Martin, "On the causes of the accumulation of certain mineral matters in plants", published in the society's Transactions and Proceedings (1912, Vol. 2). Armstrong was married to Elizabeth Wright (born Flinn). Natal Scientific Society. Transactions and Proceedings, 1911-1912, Vol. 2. National Automated Archival Information Retrieval System (NAAIRS). http://www.national.archives.gov.za/naairs.htm Repository NAB, Documents relating to Armstrong, James Alexander Haddon. South African Association for the Advancement of Science. Report, 1907, 1909, 1910. The Naturalist, 1911, Vol. 1, Numbers 3, 5 and 6: Council of the Natal Scientific Society, and papers by Armstrong. University of the Cape of Good Hope. Calendar, 1903/4, 1917/8.